After reigning supreme for decades, traditional rockets may be supplanted by their more efficient air-breathing brethren as the preferred method of reaching space. Air-breathing supersonic propulsion, such as a ramjet, may receive an efficiency boost from a new design recently proposed in the AIAA Journal of Propulsion and Power. Reaching space is accomplished at a massive energy cost, so any efficiency increase can have a huge impact on the number of satellites (or people) that a launch vehicle can take to space. Accessing space more efficiently reduces the cost required to propel people and satellites to space, enabling more new technology and adventures at a lower cost. Although rockets are the only type of propulsion that works in space (since they have both propellants on-board), air-breathing engines, which use atmospheric air as a propellant, provide greater efficiency when closer to Earth. Used together, rockets and air-breathing propulsion, such as ramjets, expend energy more effectively than rockets alone. In a rocket based combined cycle (RBCC), an air duct with a rocket inside can propel itself by rocket, ramjet or scramjet (See figure below). First, the internal rocket is used to accelerate the vehicle to supersonic (above Mach 1) speeds, using atmospheric air (1). Later (2), the air duct transitions to ramjet mode, where the air in the duct is ignited to provide thrust. After ramjet speeds are exceeded, the RBCC engine becomes a scramjet (3) and then eventually a rocket (4) once more. This set-up utilizes the most mass-efficient engine type at each supersonic stage*. Etele, Hasegawa, and Ueda proposed a modification to the internal rocket nozzle of a RBCC engine that boosted the combustion efficiency of the ramjet. 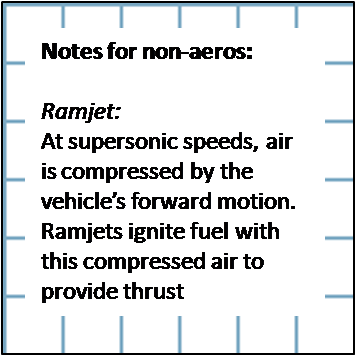 The ramjet produces thrust more efficiently if there is more atmospheric air available. In order to increase the amount of captured air, or entrained air, in the ramjet area, the team proposed a deviation from the commonplace circular rocket nozzles and its replacement with an annular geometry. At the tested pressures, this new design entrained more air within the duct and more thoroughly mixed the air in the duct when compared with a circular nozzle. 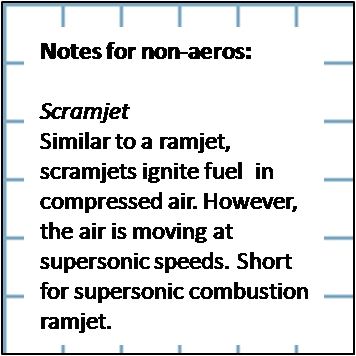 These conditions improve ramjet combustion, improving how fast the vehicle can propel itself. Further efficiency increases in air-breathing engines, such as the annular rocket nozzle, could eventually improve launch vehicles, leading to more cost-effective access to space. *Note: The turbine based combined cycle uses a turbine (like a jet) at low altitude and subsonic speed (below Mach 1), which is more effective at that altitude and speed, but has a huge mass cost. Turbines are heavy to lug around at higher altitudes when they are no longer effective. A more technical synopsis of the experiment is available here.